Our brothers from another mother, Naked Gods, are touring the Northeast, up from their home in Boone, NC, in support of their new album, No Jams. When we were on tour in March, heading back home from SXSW, we stopped in Boone to play the Boone Saloon with Naked Gods. That bar is basically their second home. 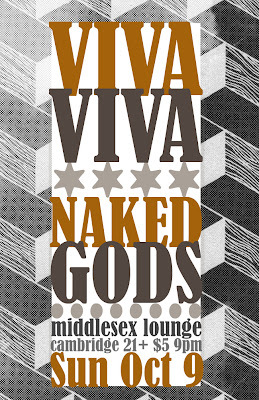 We couldn't be happier to return the favor, by having them play at our second home, the Middlesex Lounge. The magic happens, Sunday October 9, at 9pm, $5 cover, and it's 21+ of course. Make sure to RSVP on the facebook event page. The last time the boys were up in Boston, they stopped over at the Band In Boston house and recorded an amazing Flophouse Session with Jen and Andy. Check it out, and make sure you don't miss what is sure to be a great nite at the Middlesex next week. Here is our SXSW tour video diary entry, with clips from our Boone Saloon show with the Naked Gods. Good times!